"Lovesick Blues" is a show tune written by Cliff Friend and Irving Mills. The song first appeared in the 1922 musical Oh, Ernest. It was recorded by Emmet Miller in 1928 and later by country music singer Rex Griffin. The recordings by Griffin and Miller inspired Hank Williams to perform the song during his first appearances on the Louisiana Hayride in 1948. Receiving an enthusiastic reception by the audience, Williams decided to record his own version despite initial push back from his producer Fred Rose and his band. Several cover versions of the song were recorded. The most popular, Frank Ifield's 1962 version, topped the UK Singles Chart. In 2004, Williams' version was added to the National Recording Registry. "Lovesick Blues" was originally entitled "I've Got the Lovesick Blues" and published by Jack Mills, Inc. in 1922; Irving Mills authored the lyrics and Cliff Friend composed the music. It was first performed by Anna Chandler in the Tin Pan Alley musical Oh! Ernest and first recorded by Elsie Clark on March 21, 1922 with OKeh Records. Following the recording, Cliff and Friend copyrighted the song on April 3, 1922. It was featured in a show at the Boardwalk Club in New York City in June 1922 and also recorded by Jack Shea on Vocalion Records later that summer. On September 1, 1925, OKeh Records sent scout Tommy Dorsey, Jimmy Dorsey, Eddie Lang, and Leo McConville), Miller re-recorded the song, which was subsequently released to weak sales. Miller's version was covered by country music singer Rex Griffin in December 1939 on Decca Records. Griffin rearranged the song by using the original chorus--"I got a feeling called the blues"—as a verse and turning the verse "I'm in love, I'm in love, with a beautiful gal" into the new chorus. Hank Williams, who heard both the Miller and Griffin versions, started performing the song on the Louisiana Hayride shortly after joining in August 1948. Horace Logan, the show's producer and programming director for KWKH, reported that the audience "went crazy" the first time Williams performed the song on the show. In light of the live audience's strong positive reaction, Williams decided to record the song. His decision was questioned by his musicians and also his producer, Fred Rose, who felt that the song did not merit a recording. Williams persisted, and the recording took place during the final half hour of a session recorded at Herzog Studio in Cincinnati, Ohio, on December 22, 1948. For this recording, Williams replaced the jazz musicians with a modern country music band, using a rhythm guitar, mandolin, string bass, drums and a steel guitar. Williams' session band was composed of Clyde Baum (mandolin), Zeke Turner (electric guitar), Jerry Byrd (steel guitar), Louis Innis (rhythm guitar), Tommy Jackson (fiddle) and Willie Thawl (bass). With little time left, Byrd and Turner replicated the musical arrangement they previously used on an Ernest Tubb session for a cover of Jimmie Rodgers' "Waiting for a Train". Williams combined Griffin's lyrical arrangement with a two-beat honky-tonk track, borrowing the yodeling and beat drops from Miller's recording. "Lovesick Blues" was recorded in two takes. After the recording, Williams told Rose that he bought the song from Griffin. Rose sent publishing information to MGM Records, crediting Griffin as the composer, Williams as the arranger, and Acuff-Rose as the publisher. The composer credit was left blank on the first pressings of the record and the release was delayed due to the publishing uncertainty. 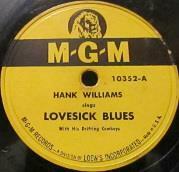 MGM released "Lovesick Blues" on February 11, 1949, coupling it with "Never Again (Will I Knock On Your Door)". The single sold 50,000 copies in the first two weeks. On its February 26, 1949 review, Billboard opined: "Hank's razz-mah-tazz approach and ear-catching yodeling should keep this side spinning". Based on votes sent to Billboard, the record was rated with 85 points by disc jockeys, 82 by record dealers and 85 by jukebox operators. Between the three, the track scored an overall of 84. In reference to its 100-point scale, Billboard regarded the record as "Excellent". It reached number one on Billboard's Top C&W singles, where it remained for sixteen weeks and reached number twenty-four on Most Played in Jukeboxes. The magazine listed it as the "number one country and western record of 1949" while Cashbox named it "Best Hillbilly record of the year". In March 1949, Wesley Rose requested Williams to send him the records by Griffin and Miller to prove that the song was in the public domain. Irving Mills, the original lyricist, sued Acuff-Rose. The suit was settled on November 1, 1949 and it was agreed that Mills and Acuff-Rose would share the publishing of Williams' recording. Mills retained the rest of rights to the song as he had also purchased Friend's rights during the Great Depression. Following the success of the song, Williams was invited to appear as a guest on the Grand Ole Opry, on June 11, 1949. After the performance, Williams received a standing ovation. "Lovesick Blues" became his signature song, which he used to close his shows. It was also his first number one hit, and garnered Williams the stage nickname of "The Lovesick Blues Boy". In 1949, the singer received second billing behind Eddy Arnold on the list of the "Year's Top Selling Folk Artists". Williams' version of the song was featured in the films The Last Picture Show (1971) and The Shawshank Redemption (1994). In 2004, "Lovesick Blues" was added to the National Recording Registry by the Library of Congress. Singer Sonny James released a cover version of the song on the flip side of "Dear Love" in June 1957. The song peaked at number fifteen on Billboard's Hot Country Songs. Floyd Cramer's 1962 version of the song peaked at eighty-seven on the Billboard Hot 100. In December 1962, Frank Ifield's version of "Lovesick Blues" topped the UK Singles Chart, and reached number forty-four on the Billboard Hot 100 the following month. Gramophone compared his singing to a "rough and raucous Jimmie Rodgers". Meanwhile, Elizabethan delivered a negative review, stating: "No true Country singer would dare do to a Hank Williams number what Frank Ifield has done to 'Lovesick Blues'". The review finished by declaring that Ifield had "none of Jim Reeves' depth and character, nor of the subtle melodic quality (of) Don Gibson". By the end of February 1963, Billboard estimated that the single had sold close to a million copies worldwide. In 1992,  The single peaked at number twenty-two on RPM's Country Tracks. Other covers include versions by Slim Whitman, Patsy Cline, Glen Campbell, Merle Haggard, Charley Pride, Jerry Lee Lewis, Little Richard and LeAnn Rimes. ^ Tosches 2009, p. 247. ^ Tosches 2002, p. 157. ^ a b Harwood 2008, p. 108. ^ Tosches 2002, p. 158. ^ a b Jennings 2008, p. 211. ^ a b c Escott 1994, p. 99. ^ a b Harwood 2008, p. 110. ^ Deikman 2007, p. 13. ^ a b Campbell 2011, p. 126. ^ a b Kosser 2006, p. 22. ^ a b c Koon 1983, p. 41. ^ Escott 1994, p. 96. ^ a b c Escott 1994, p. 97. ^ Koon 1983, p. 153. ^ Billboard staff 1949, p. 116. ^ a b Jennings 2008, p. 212. ^ Koon 1983, p. 41, 42. ^ Williams 1981, p. 1. ^ a b Williams 1981, p. 82. ^ Escott 1994, p. 100. ^ Tyler 2008, p. 174. ^ a b Billboard staff 1957, p. 52. ^ Whitburn 2005, p. 186. ^ a b Billboard staff 1962, p. 2. ^ a b Billboard staff 2 1962, p. 37. ^ a b Billboard staff 1963, p. 23. ^ Gramophone staff 1962, p. 316. ^ Valentine 1963, p. 4. ^ Wedge 1963, p. 25. ^ a b Whitburn 2005, p. 619. ^ a b RPM staff 1992, p. 2. ^ Jennings 2008, p. 213. Billboard staff (1949). "Record Reviews". Billboard (Nielsen Business Media, Inc) 61 (9). Billboard staff (1957). "Tips on Coming Tops". Billboard (Nielsen Business Media, Inc) 69 (24). Billboard staff (1962). "Billboard Music Week Hot 100". Billboard (Nielsen Business Media, Inc) 74 (16). Billboard staff 2 (1962). "Hits of the World". Billboard (Nielsen Business Media, Inc) 74 (49). Billboard staff (1963). "Billboard Hot 100" 75 (4). Nielsen Business Media, Inc.
Campbell, Michael (2011). Popular Music in America: The Beat Goes on. Cengaging Learning. Deikman, Diane (2007). Live Fast, Love Hard: The Faron Young Story. University of Illinois Press. Escott, Colin (1994). Hank Williams: The Biography. Hachette Digital, Inc. p. 307. Gilliland, John (1969). "Pop Chronicles: Tennessee Firebird: American country music before and after Elvis". 1. Episode 9. KRLA 1100. http://digital.library.unt.edu/ark:/67531/metadc19757/m1/. Gramophone staff (1962). Gramophone (General Gramophone Publications Limited) 40. Harwood, Robert (2008). I Went Down to St. James Infirmary: Investigations in the Shadowy World of Early Jazz-Blues in the Company of Blind Willie McTell, Louis Armstrong, Don Redman, Irving Mills, Carl Moore, and a Host of Others, and Where Did This Dang Song Come from Anyway?. Harlan Press. Jennings, Dana (2008). Sing Me Back Home: Love, Death, and Country Music. Macmillan. Koon, George William (1983). Hank Williams, so Lonesome. University of Mississippi press. Kosser, Michael (2006). How Nashville Became Music City, U.s.a.: 50 Years of Music Row. RPM staff (1992). "RPM100 Country Tracks". RPM 55 (13). Tosches, Nick (2002). Where dead voices gather. Little, Brown and Co.
Tosches, Nick (2009). Country: The Twisted Roots of Rock 'n' Roll. Da Capo Press. Tyler, Don (2008). Music of the post war era. ABC-Clio. Valentine, Anne (1963). "Music Review". Elizabethan (Periodical Publications) 16. Wedge, Don (1963). "Disk Retailers Association Meets" 75 (8). Nielsen Business Media, Inc.
Whitburn, Joel (2005). Joel Whitburn's Top Country Songs: 1944–2005, Billboard. Record Research. Williams, Roger M. (1981). Sing a sad song: the life of Hank Williams. University of Illinois Press. "A Church, a Courtroom, and Goodbye"
"Three Cigarettes (In an Ashtray)"
"Come on in (And Make Yourself at Home)"
"I Can See an Angel"
"If I Could See the World"
"Gotta Lot of Rhythm in My Soul"
"Who Can I Count on"